It taste little bit sour but good! 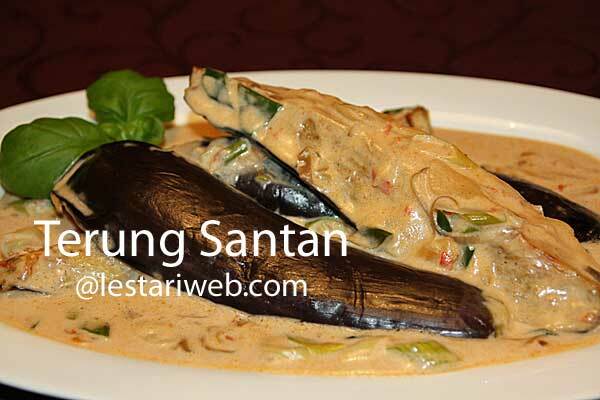 Many sources suggest difference versions, whether shrimp paste is used or not in this recipe. The choice is yours! Cut the aubergines/ eggplants in half lengthways. If too large then cut in quarters. 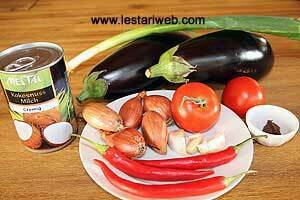 (If necessary soak aubergines in a salty water to prevent the brownish colour, rinse & dry them properly). Heat the oil in a wok and deep-fry the aubergines until it's white colour turns to brown. Set aside to drain. Put all ingredients for the paste in a mortar/grinding stone and grind until smooth. Heat 2 tbsp oil in a wok & strir-fry the spice paste, sliced shallots & garlic. Stirring all the time until fragrant. Add the coconut milk & bring to boil. Stir occasionally to prevent the coconut milk from separating. Adjust the seasoning. Add the vinegar, salt and sugar. Continue to simmer until the sauce is quite thick. Add the sliced tomatoes & spring onions. Simmer for about 1-2 minutes only to prevent overcooked. Put the fried aubergines on a serving plate & pour the sauce over them evenly. Serve right away.